Welcome to the home of PANDA DCS wiki. The present structure of PANDA experiment involves several sub-detectors and sub-systems (Fig.1). The Slow Controls (SC) of each PANDA sub-detector and sub-system are planned to be monitored and controlled from a supervisory software application. In the past, an evaluation of several SCADA development packages ( PVSS, LabView, EPICS) was performed by a PANDA slow controls subgroup and the EPICS package was selected to be the main PANDA SC software development tool. Due to the anticipated complexity of the whole PANDA DCS and the expected staged assembly of PANDA detector, the DCS is highly needed to be modular and scalable. 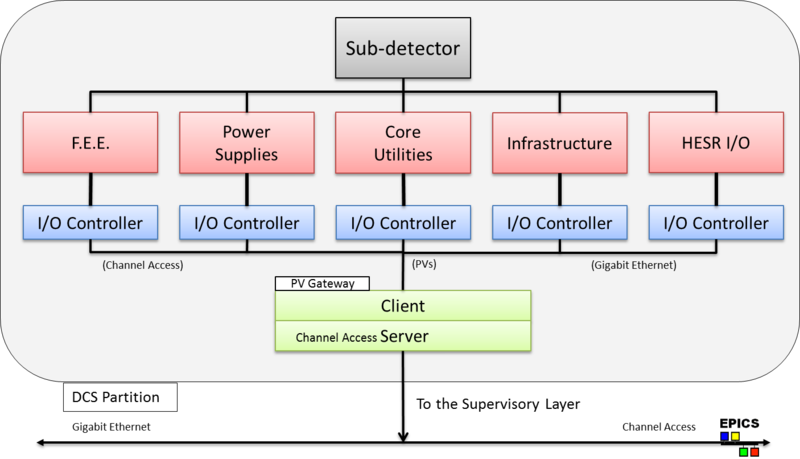 In order to accomplish this, each PANDA sub-detector or sub-system is envisaged to be basically autonomous but manageable from a supervisory layer﻿﻿. The autonomy of each PANDA DCS partition (Fig. 2) implies that the partition should be self-controllable. This means that, specific slow control software, tailored to configure, monitor and control the hardware devices belonging to the partition, is required. Moreover, the partition specific software must be capable to share data with the supervisory layer. In order to ensure compatible data sharing between the DCS supervisory layer and DCS partition, an EPICS Process Variable Gateway is required to be implemented by each PANDA DCS partition. Additionally, the PV Gateway will provide access rights administration and subnet interface. The SC operation of each partition will be performed from a dedicated graphical user interface (GUI). The interface must ensure the accurate and safe operation of the partition hardware. The complete interface, or part of it, will be embedded in the PANDA supervisory software. At the moment, the state of the art user interface to EPICS is supported by the Control System Studio (CSS) framework. The technical design of PANDA DCS is planned to provide a set of guidelines for naming conventions, and graphical interface look and feel, in order to guarantee the similarity of the independent developed modules and to simplify the integration. The outcome of putting all the above requirements together is a PANDA DCS architecture based on a three-layer design – Supervisory, Control and Field layers. The highest level is the Supervisory one. The Control Layer is in the middle and it is the level where all the PANDA DCS partitions are connected. The Field Layer is embedded in each PANDA DCS Partition, and is made of all the devices and sensors used to monitor and control the sub-sytem. Because the device driver software support in EPICS is limited, the software development tools used to control the lowermost layer (Field Layer) are at the free choice of the developer. The only constrain here is that the software must be integrated in the control layer with the EPICS system. However, the recommendation is that the developer, in the early stages of design, should try implement, were is possible, the same hardware and software, with EPICS support, realized by other PANDA sub-systems. the autonomous operation of the partition. organize the development of the DCS supervisory software. SupportedHardware is a wiki describing the proposed/tested/supported sensor/control hardware for the PANDA DCS. Early contributions have the chance to set the standards and significantly help other detector subgroups. Please contribute. The naming convention for PANDA slow control process variables is outlined in this wiki: PVNamingConventions. We recommend implementing these rules early, to avoid later confusion. 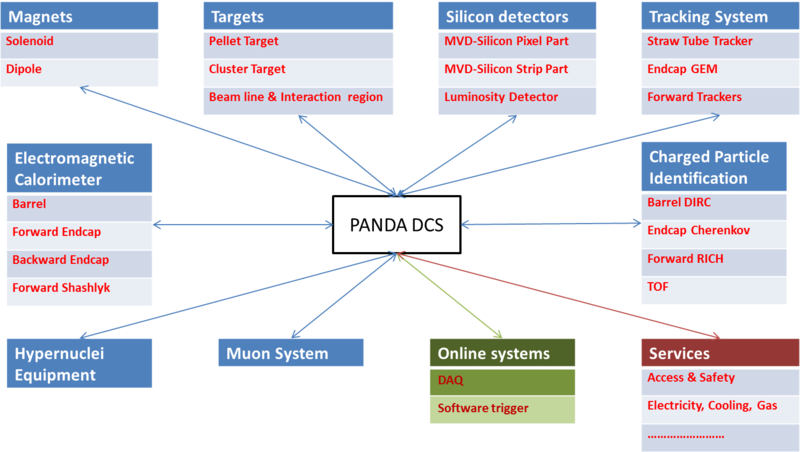 The DCS group has prepared a draft for the "Concept for the Interface between the PANDA Detector Control System and the Front-End Electronics". It will be discussed at the PANDA DAQ/FEE workshop 28 May - 30 May 2018. To gain write access to this wiki, you have to be a member of the PandaControlsGroup. This is also required for being able to upload your talks to the TalksArchive. If you want to become a member of the PandaControlsGroup, ask its coordinator Florian Feldbauer. The master archive with presentations from all our subgroup meetings is here: TalksArchive. Please attach your talks using your account, such that the author name is visible and easy to search for. Preferred format is PDF. The DCS subgroup forum is located here. The PANDA SC subgroup has been formed in 2007. The subgroup is basically made by people, from different PANDA collaborating institutions, involved in the slow controls of the experiment, chaired by the SC sub-system manager. The most up-to-date list of DCS members can be found here. The present subgroup chairman is Florian Feldbauer. The DCS mailing list is panda-dcs@gsi.de.